This historically rich property lies in the town of Halsted, Essex and offers a spacious six-floor living space. With the ability to accommodate 250 people, it makes it the perfect venue for parties. 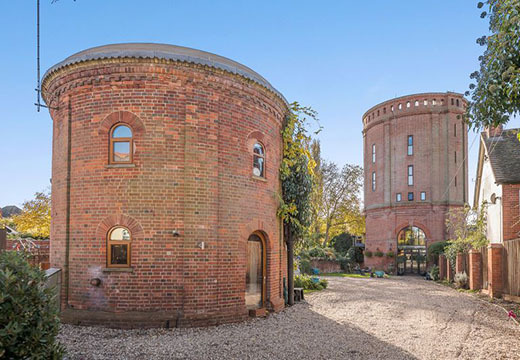 The property includes two red-bricked detached towers, a double oak garage and a beautiful garden with its own outdoor pizza oven. The oldest water tower dates back to the 1800’s. The newer one was built in the industrial revolution by the Courtauld family- a famous name in the British textile industry. They required a bigger water supply for their factory, so accordingly built a direct pipeline from the tower to their factory. A glass arch stretching over two floors encompasses the front door. The ground floor holds a large reception area and a cloakroom with an open tread staircase leading up to the first floor. The fascinating thing about this property is the hidden staircase leading all the way to the 5th floor. It was originally designed in order to comply with building regulations but now can be used by people wanting to escape up to the top without being seen. The first floor features a gallery balcony with views of the reception hall beneath. There are double doors, which leads to the outdoor balcony area. On the second floor an open planned kitchen and dining area can be found with extensive storage. The four bedrooms and family bathrooms can be found on the remaining floors. The fifth floor makes for a great entertaining area as it features a 10m atrium with a glass roof. There is a staircase that leads to the roof terrace with stunning views of the Halstead countryside. The second tower has only two floors, with the ground floor containing an open plan living and kitchen area. On the first floor is the bedroom area including a shower room. The unique feature here is the exposed original pipework that was used to pump water from the well.